Disable selected Triggers, Validation Rules, Flows, Workflows, and Restricted Picklists before data is restored to Salesforce. 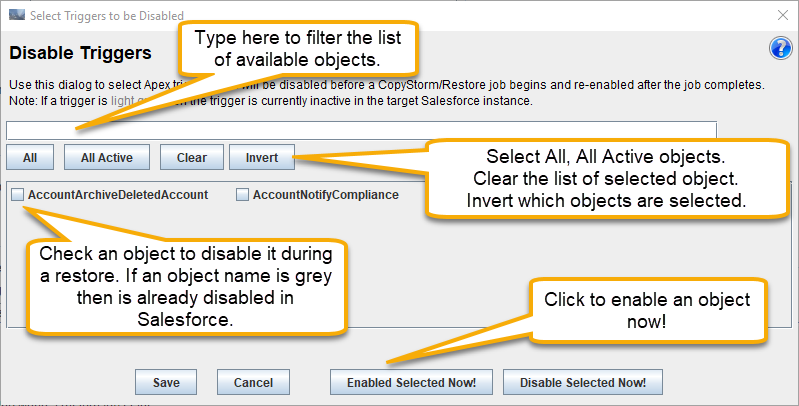 Re-enable selected Triggers, Validation Rules, Flows, Workflows, and Restricted Picklists after the restore is finished. CopyStorm/Restore will always re-enable them, regardless of the success or failure of the restore. Automatically detect and disable Validation Rules, Workflows, and Restricted Picklists associated with tables. Though there is separate editor tab for each kind of object that may be disabled/enable, all editors follow the same general pattern. An optional checkbox for enabling automatic management for disablement/enablement. Where applicable this feature saves a lot of time by avoiding manually picking rules. A Edit button may be used to launch a dialog which supports manual selection of rules to disable/enable. For some objects, like Triggers, manual selection is the only option. A Clear button that will clear all selected objects (e.g. no objects will be selected for disablement/enablement). A Text area that lists selected objects. For speed the list in the text area may be edited by hand.